Chances are, you've seen this recipe before. Published by the New York Times in early fall every year beginning in 1982, until 1989, when Marian Burros announced that it would be printed for the last time. She received a flood of angry letters, "I look for the plum torte each year, as I look for the Declaration of Independence on the back page on the Fourth of July and expect a wild crossword puzzle on April Fool's Day". 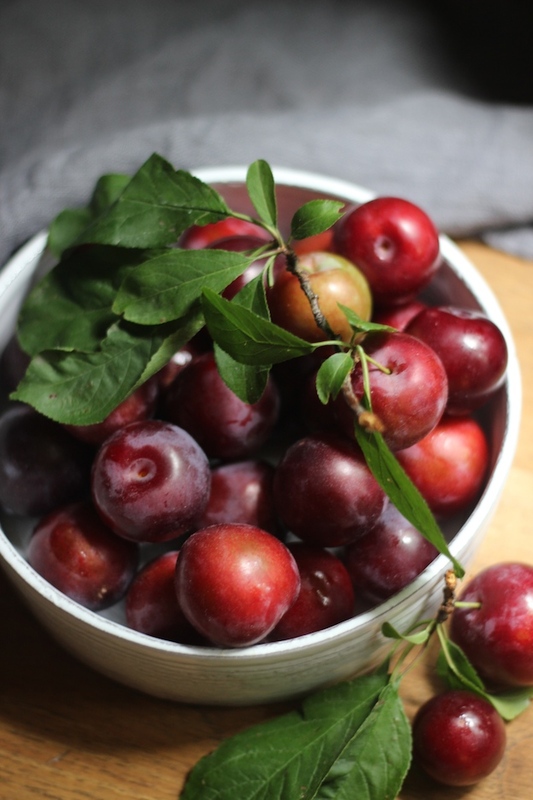 The editors promised to make the recipe easily available for each plum season to come. 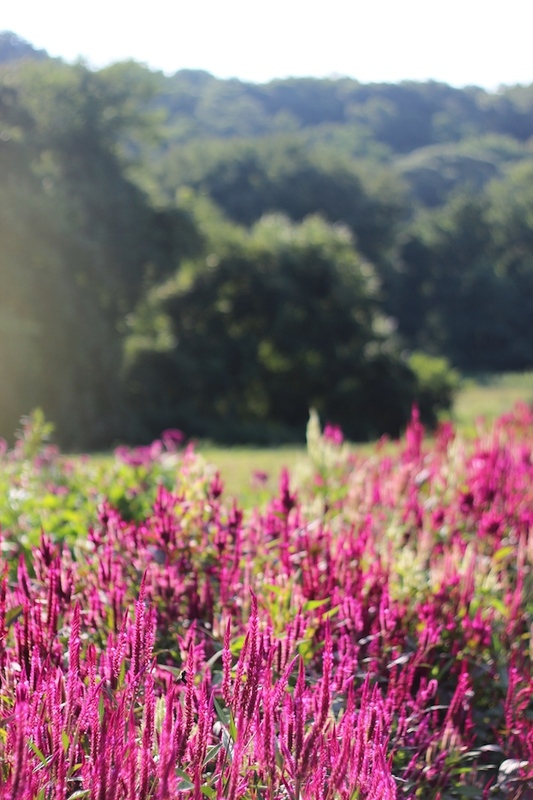 The end of summer has come and gone. The river of traffic along the main road in our small shoreline town has slowed and quieted, summer cottages left vacant and still, ready for the winter. And, my eldest has begun her first year of high school. Only yesterday, she was bringing me flowers too tiny for any vase, perfect, miniscule bouquets floating in bottle caps, carrying her favorite plastic dinosaurs with her to go shopping at the supermarket, asking me to come back and sing her good night song. Then I turned around, to find her grown into someone tall and confident, sensitive, and kind. I watch as she is whisked down the driveway to school, her pale, waving hand disappearing. Today, she makes me laugh so hard I cry, teaches me the French I had always wished I had learned, is for a moment some lovely young woman I don't recognize when I catch a quick glimpse of her across the aisles in a shop. So, a cake to celebrate the new season, my favorite season, fragrant with the last of the abundance of white peaches we picked in the summer. 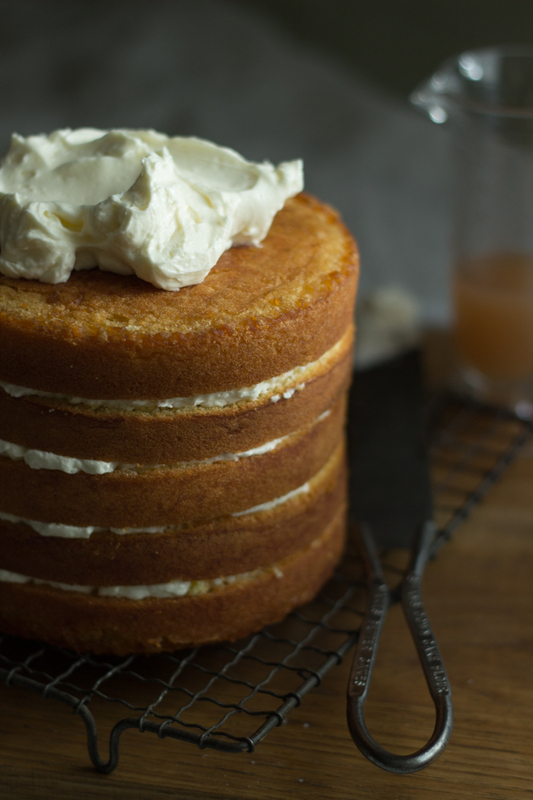 The yellow sponge cake recipe is taken from John Barricelli's The Seasonal Baker, but I added a drizzle of peach and elderflower liqueur syrup to the layers. Yesterday felt like fall. The air was crisp, cool, and dry, with dappled golden sunlight. There were patches of yellow and red appearing in a few of the trees. With two weeks left of summer, my daughters are reviewing, crossing off entries in their summer lists. These include things like "go kayaking", "go raspberry picking", and "make peanut butter buckeye ice cream". 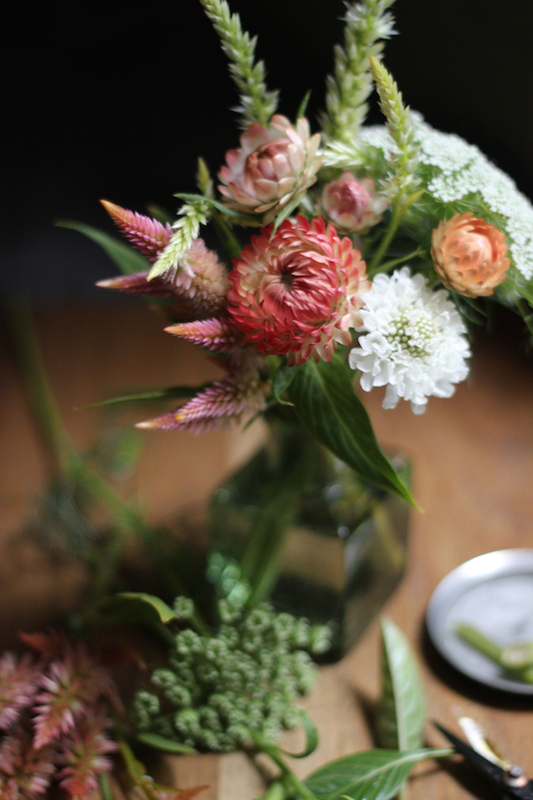 One of the pleasures of summer is picking flowers at a nearby pick-your-own field. 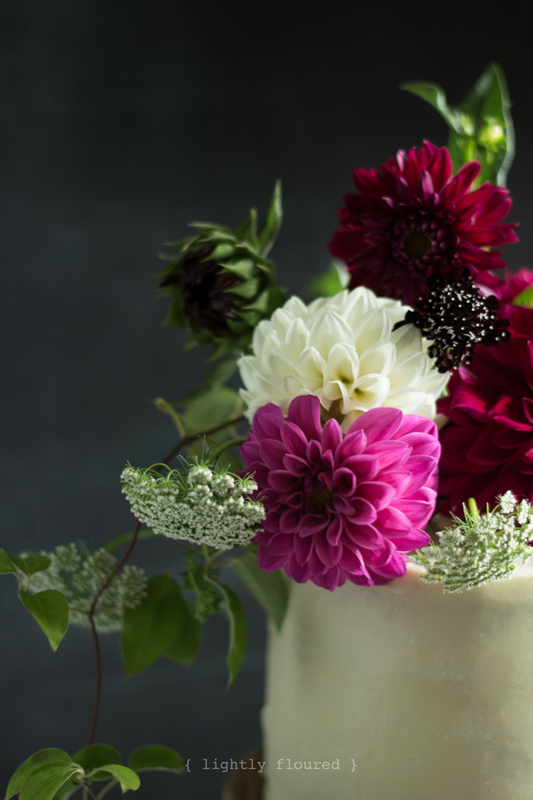 We make our way among rows of color with a pair of pruners; brilliant velvet cockscomb, papery strawflowers, ruffled cosmos on delicate stems, towering pale sunflowers, and the orbs of nodding dahlias. Fuzzy bees, tiny honeybees, and blue wasps whirring around our arms and ears, dust collecting on our shoes. My youngest daughter is surprised by the sudden movement and sound of wings as a group of small birds lifts from within the mass of flowers she is clipping from. 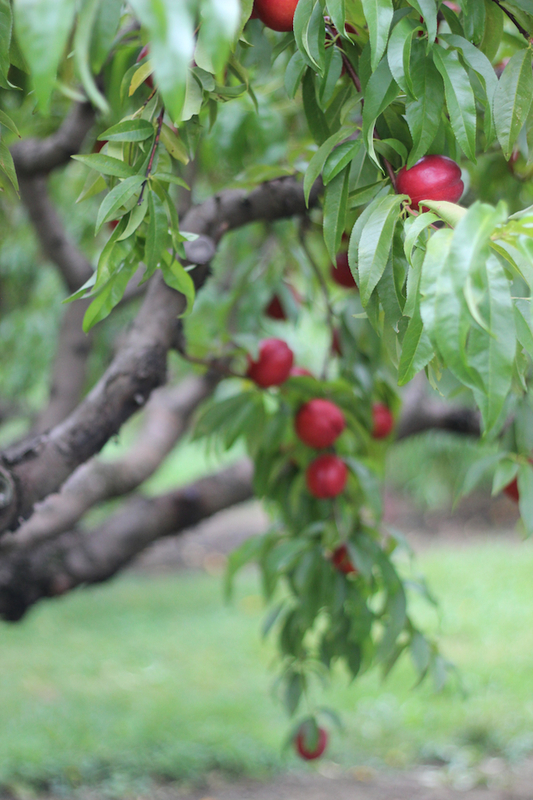 With all of the fruit picking we have done, we found ourselves with fifteen pounds of nectarines collected last week, now ripe and softened. 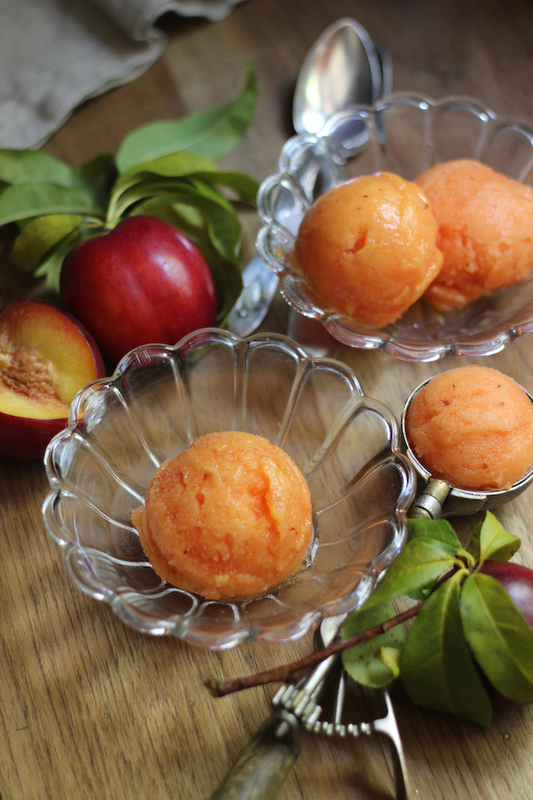 I found a recipe in Sweet Cream and Sugar Cones for nectarine sorbet. 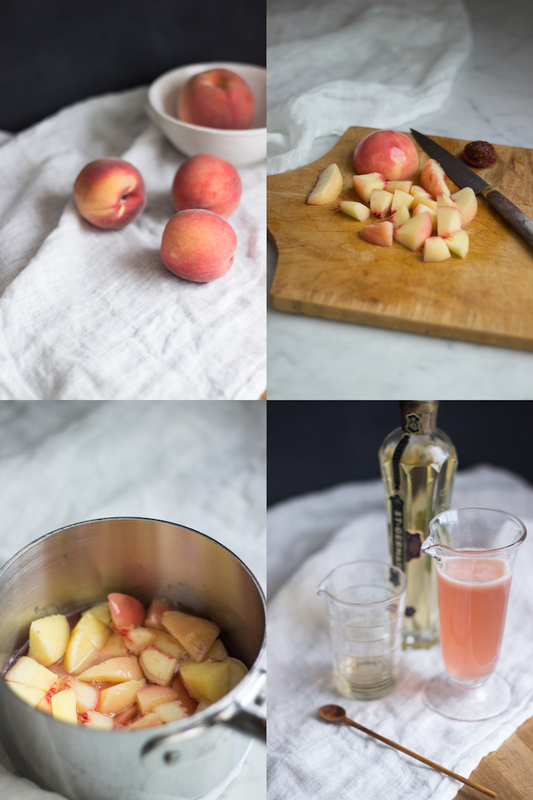 It has a smooth, creamy texture and tastes like pure, sweet nectarine. Purée the nectarines, (I then strained to remove the skins, but this is unnecessary, I will try leaving them in next time). Combine the purée with the water, tapioca (or corn) syrup, lemon juice, salt, and 1/2 cup of the simple syrup. Whisk until well combined and the salt is completely dissolved. Taste the base. 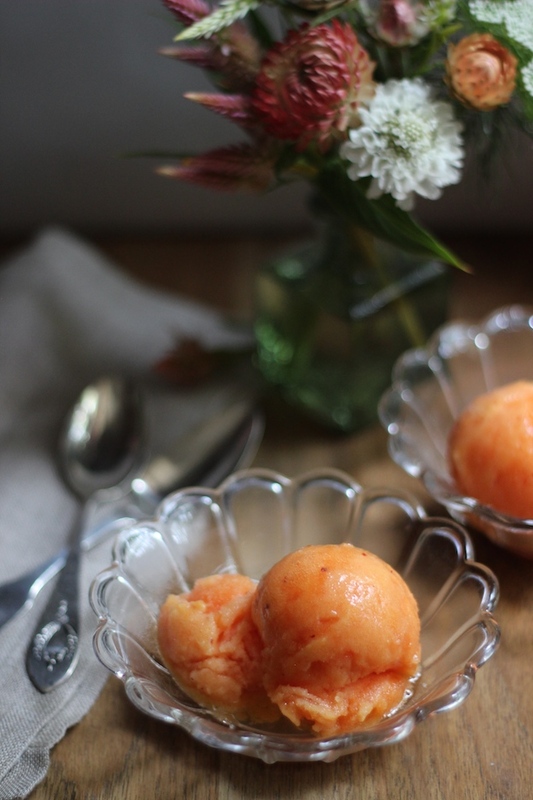 It should taste just a bit too sweet (once the sorbet is frozen, it will lose some of its sweetness). Add the remaining simple syrup if you need it. Freeze in your ice cream maker according to the manufacturer's instructions. You'll know when it is ready when it goes from a slushy consistency, to a smoother, firmer one (Unlike ice cream, there is no danger over overchurning it). While the sorbet is churning, put the container you will be storing the sorbet in, into the freezer to chill. This will help prevent the sorbet from melting as you transfer it. Enjoy right away, or for a firmer texture, transfer to the chilled storage container and freeze for about 4 hours. 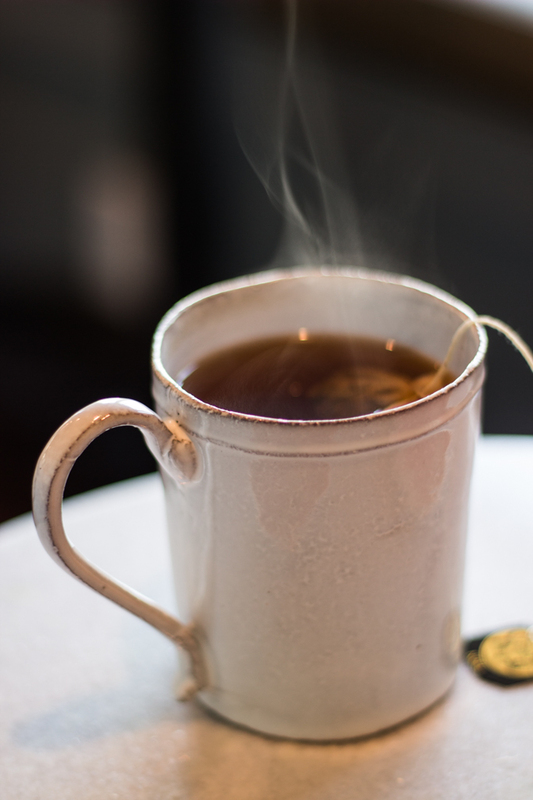 Mix the sugar and water together in a small saucepan (heavier saucepan works best here). Place over medium heat and stir until the mixture comes to a boil, simmer until the sugar has dissolved completely, about 3 minutes. Remove the pan from the heat and let cool completely. Transfer to a covered container and store in the refrigerator up to 1 month. With a light rain falling, we arrived early at a local orchard last Sunday. 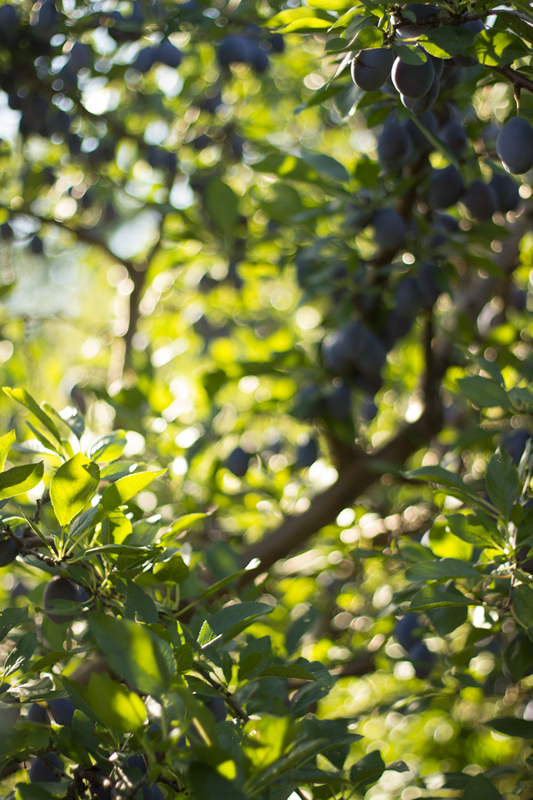 In our enthusiasm, we accidentally picked way too much fruit. Like, nearly fifty pounds too much (!) I looked down the grassy aisle to find my small daughter lugging the giant bucket of peaches she could nearly fit into herself. But, they were so amazing! Peaches! Nectarines! Yellow plums! 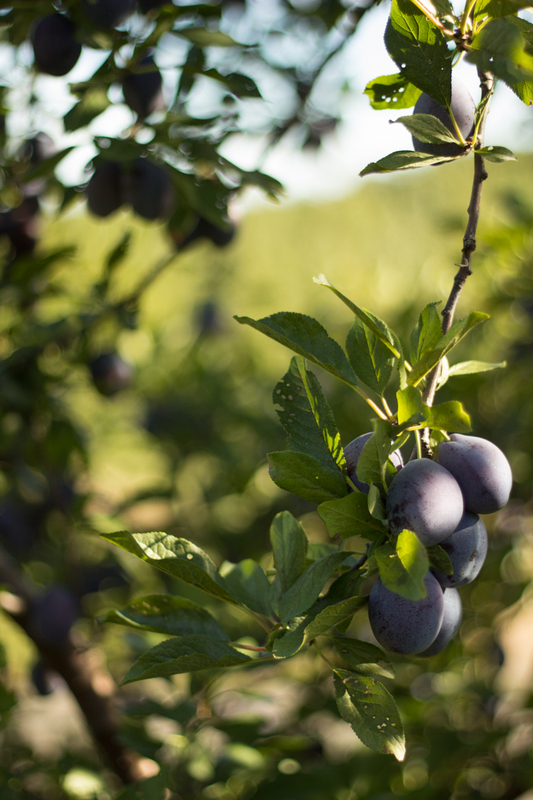 Dark plums. 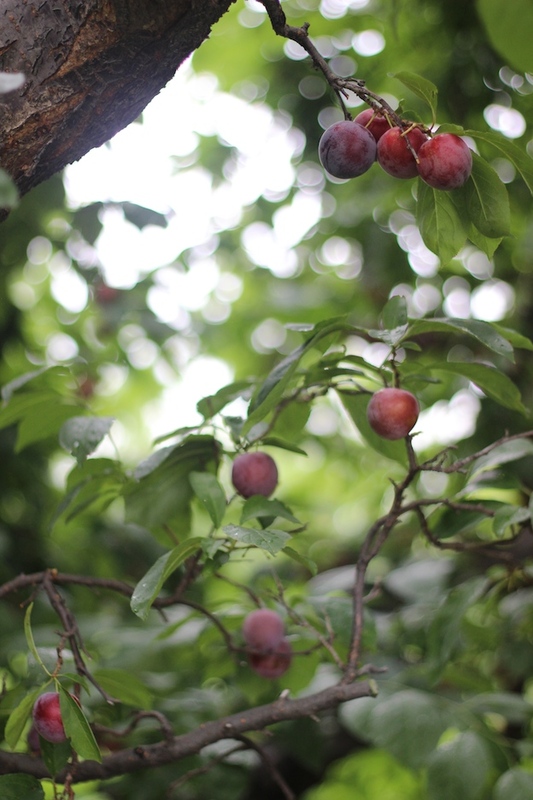 On the way home many of the plums had already split in their ripeness. With these we quickly made jam. 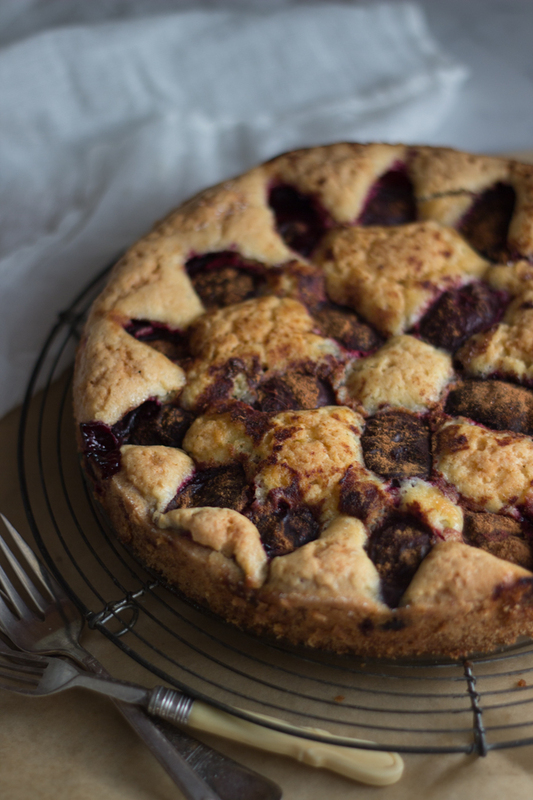 And then, a plum cake. The plums are arranged cut side down in a heavily buttered pan, caramelized sugar poured over the top, the batter spread over this before baking. 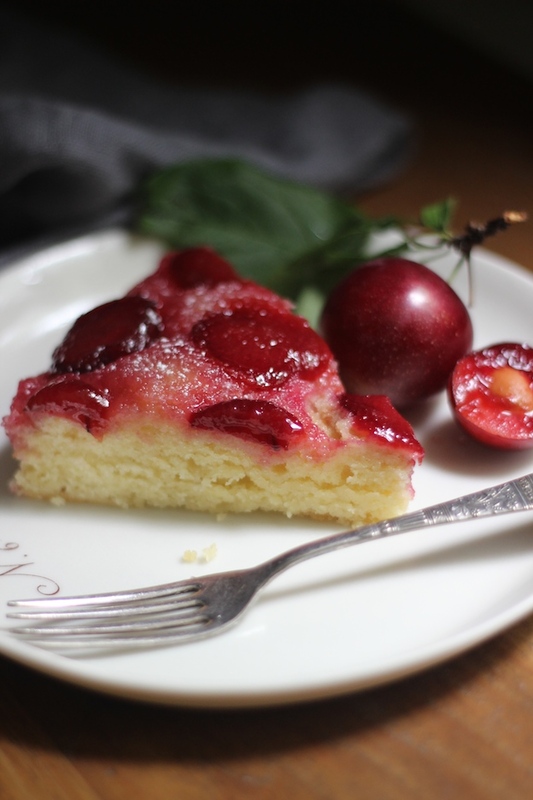 The plums release their juices into the caramel, creating a crimson-colored syrup that sinks into the cake when inverted. 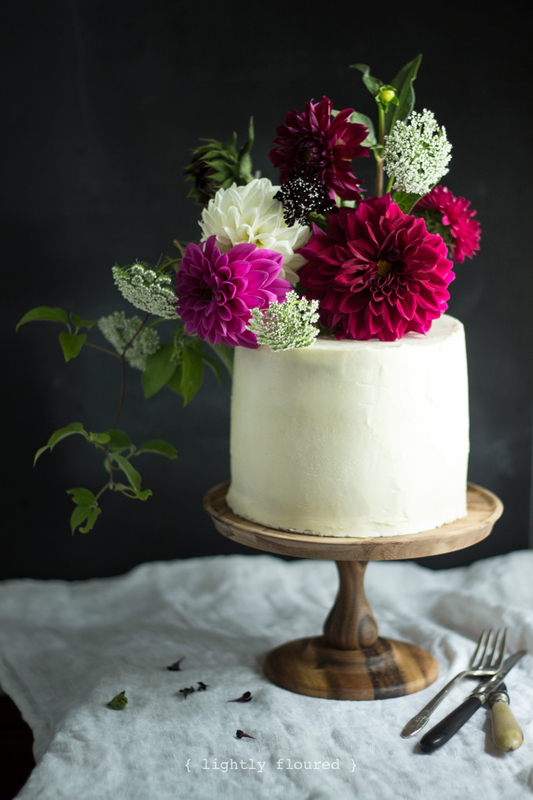 The cake itself is soft and buttery. The recipe is lightly adapted from Ina Garten, who uses Italian prune plums. Because the red plums I used were clingstone and very soft, I cut along either side of the pit, saving the middle to use in jam-making. Preheat oven to 350°. Generously butter a 9-inch glass pie dish (I used an 8-inch cake pan). Arrange the plums in the dish, cut side down. Combine 1 cup of the sugar and 1/3 cup water in a small saucepan and cook over high heat until it turns a warm amber color, about 360° on a candy thermometer. Gently tilt the pan, do not stir (stirring will encourage the formation of sugar crystals). Pour evenly over the plums. While the sugar is cooking, make the cake batter. Cream the 6 tablespoons of butter and remaining 3/4 cup of sugar in the bowl of an electric mixer fitted with the paddle attachment, until light and fluffy. Lower the speed and beat in the eggs one at a time. Add the sour cream (or yogurt), lemon zest, and vanilla and mix until combined. Whisk together the flour, baking powder, and salt, add to the butter mixture with the mixer on low speed, mixing only until combined. Pour the batter over the plums, spreading evenly. Bake 30 to 40 minutes until a cake tester inserted in the center comes out clean. Cool for 15 minutes, then invert cake onto serving plate (a plate with a lip helps here, to reign in the juicy caramel). 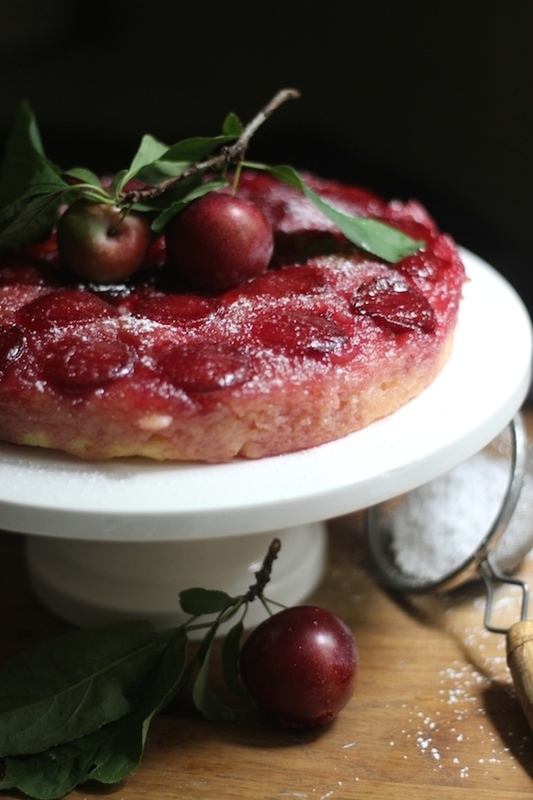 If a plum sticks, gently ease it out and replace it in the design on top of the cake. Serve warm or at room temperature dusted with confectioner's sugar. Paul is a tenant in a small house, rented over the past few years from my mother and father. It is a little red house just down the street from their place, though there are whispers of tales that a family with ten children once lived there. He lives there alone, along with his stout and gentle Rottweiler, Mandy, who sits just inside the doorway of the screened-in porch, at any given time of the day, if you happen to be driving by. Her ears are tuned for the sound of my father's car, or gravelly footstep, in hopes that he may be coming to pick her up for one of their walks, through the woods, with her racing excitedly ahead of him and back, toward the river bank. Paul is likely to be found carefully tending the garden. He tells my mother, planting daffodil bulbs by the side of the road, that when they bloom, he hopes we will think of him. 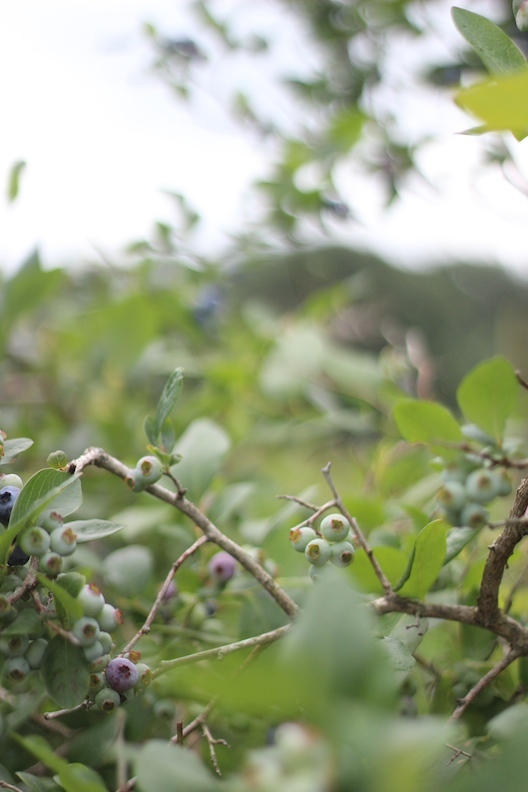 Last summer, Paul asked my mother if she thought my daughters would like to pick blueberries from the bush in the center of his front yard, saying there were far too many for his own use. 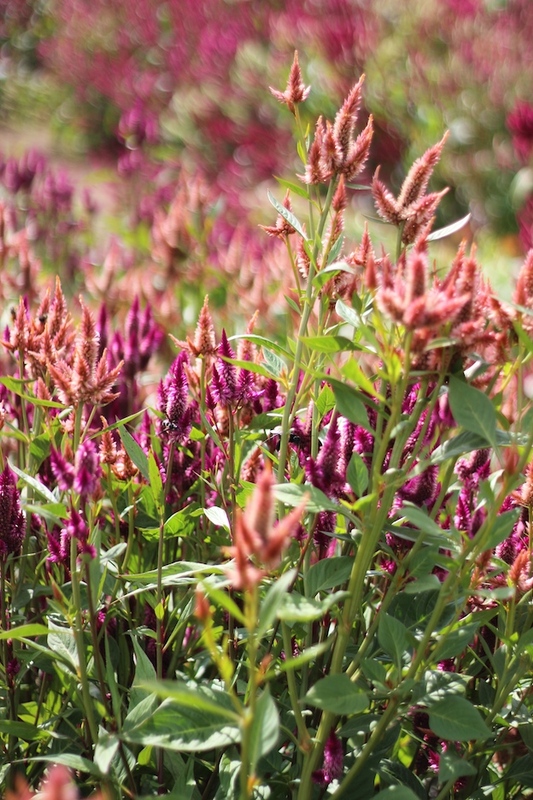 So we did, as we picked he talked with us, in his cheerful way. He told us of how, while a young soldier in Vietnam, a woman he once knew baked four dozen blueberry muffins, and shipped them to him. They arrived in crumbs, and he ate them with a spoon. 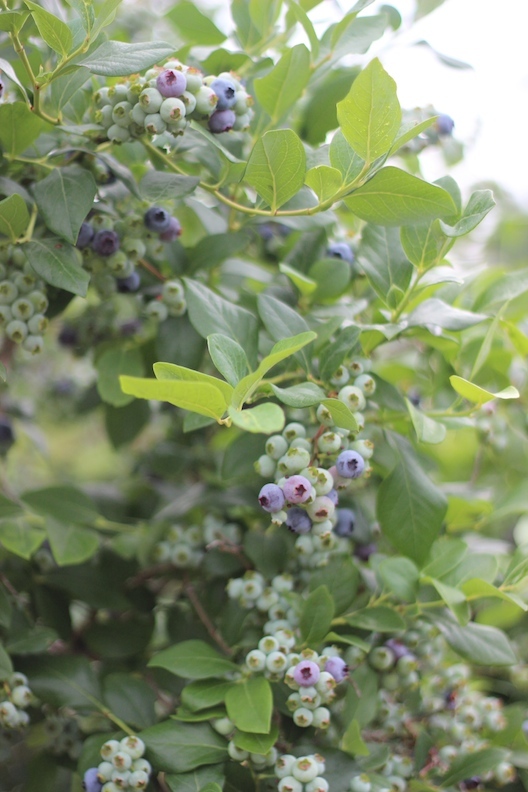 I wonder if she ever thought, as she baked and packaged and sent them, that he might think of her, decades later, whenever he saw blueberries. In the bowl of a food processor, combine flour, salt, and butter. Process for 10 seconds. Add the egg and cold water. Process just until the dough comes together into a ball, taking extreme care not to overwork the dough (this only took 7 seconds for me). Dump the dough out onto a sheet of plastic wrap, using the wrap to help you, shape into a flat disc. Place tightly wrapped dough in the refrigerator to chill and rest for at least 1 hour. Set 3 ounces of berries aside. Put the remaining berries in a bowl with the kirsch and sugar. Set these aside. Preheat oven to 375°. On a floured work surface, roll out the Pâte Brisée. 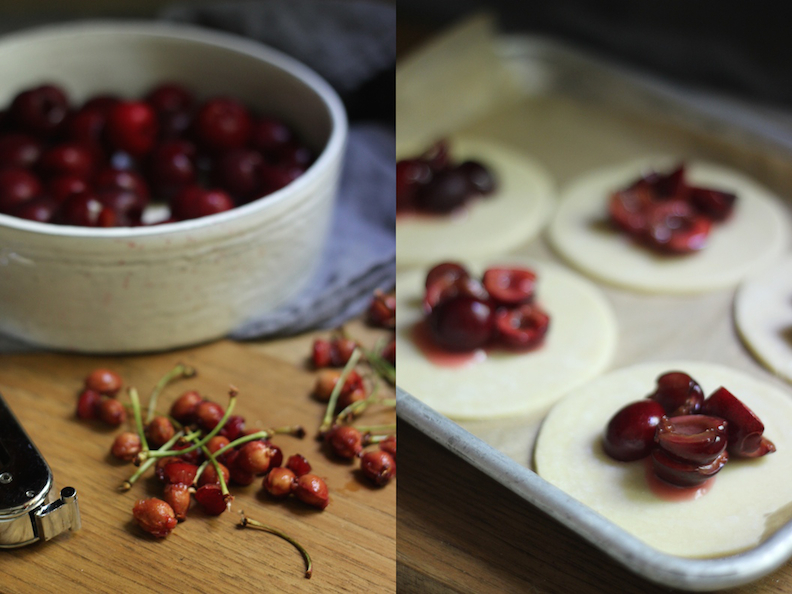 Line an 8-inch tart tin or smaller tartlet tins with the dough, and refrigerate for 15 minutes. Spread the cookie crumbs (or graham cracker crumbs) over the bottom of the pastry. 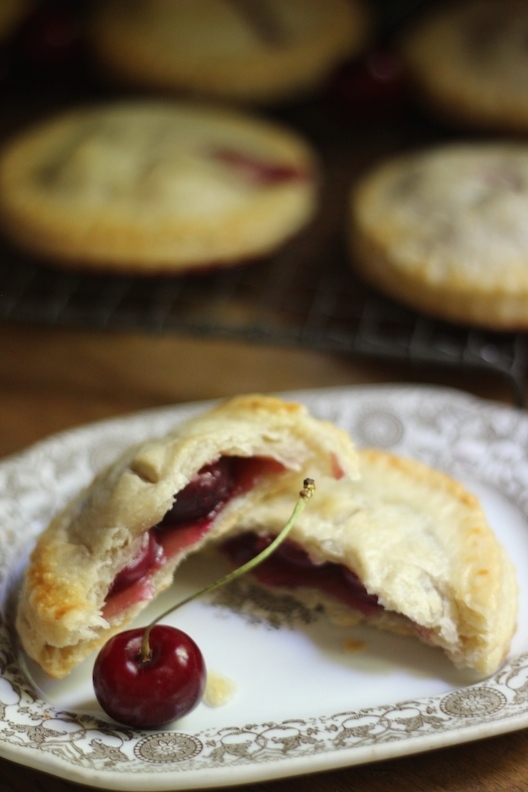 Fill the pastry with the sugared berries. 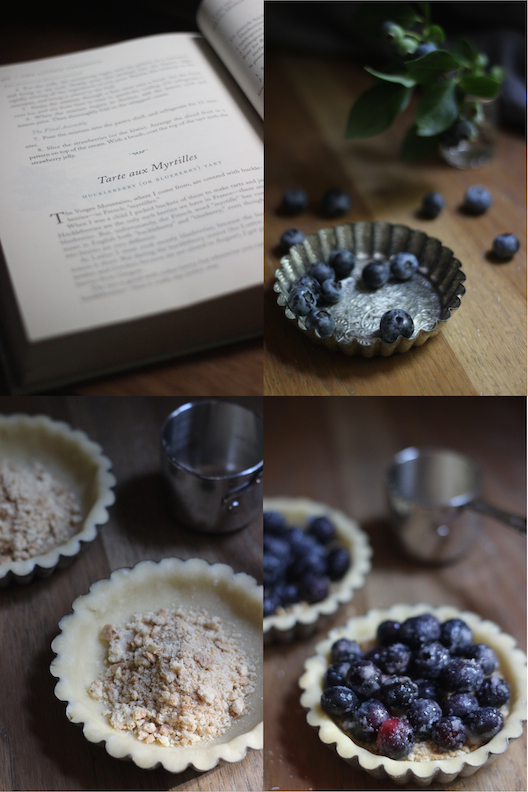 Bake the tart (or tartlets) on a sheet pan for 25 minutes. 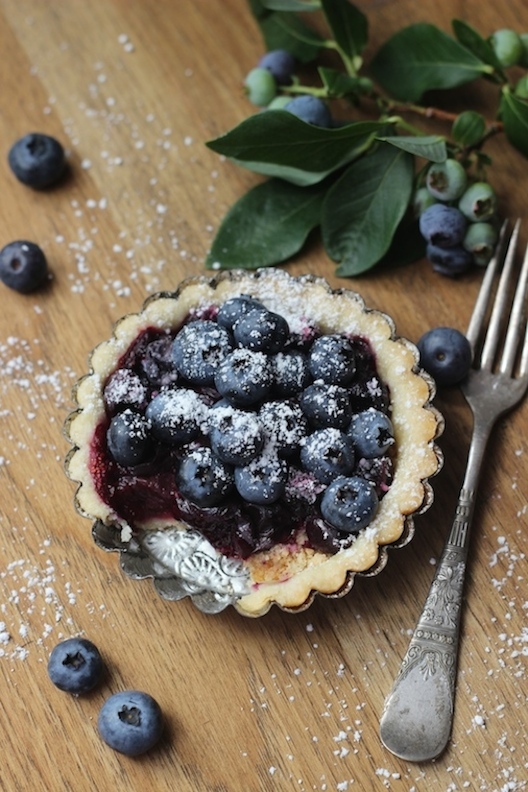 Remove from the oven, sprinkle the reserved berries over the top, gently pressing them slightly into the surface of the tart. Cool to room temperature. Sift confectioner's sugar over the top just before serving. Do not refrigerate. 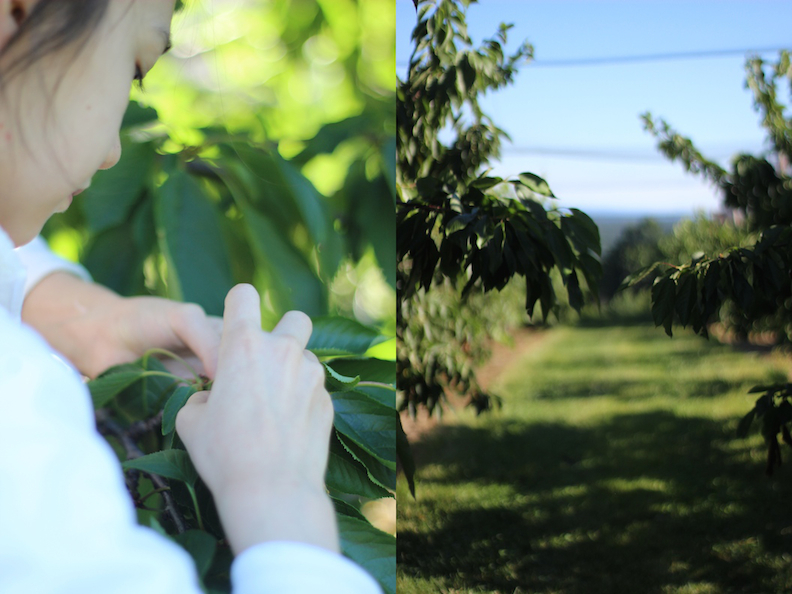 This year the cherry trees yielded only enough fruit for a single day of picking for the season. 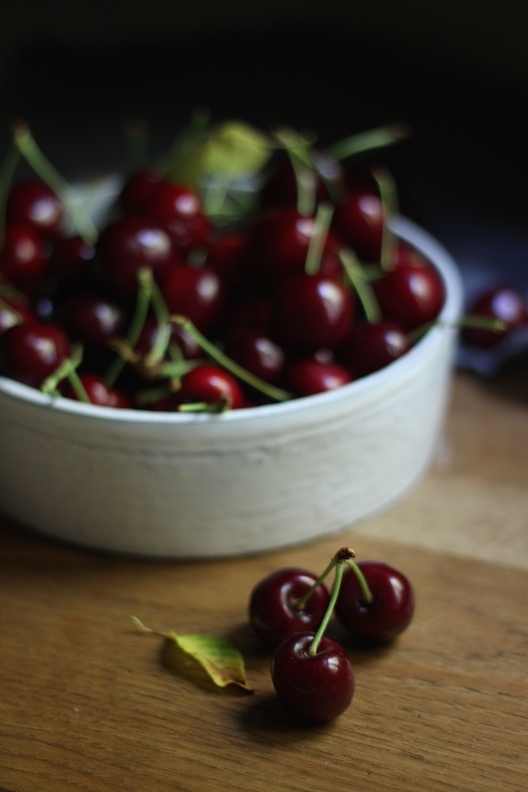 We arrived in early morning, with dreams of cherry clafoutis, cherry sorbet, and sweet cherry pies. Our car climbed to the summit of Belltown Hill, with amazing views of the valley below, the city of Hartford glittering in the distance, the last of the winds trailing behind Hurricane Arthur sweeping through the orchard. 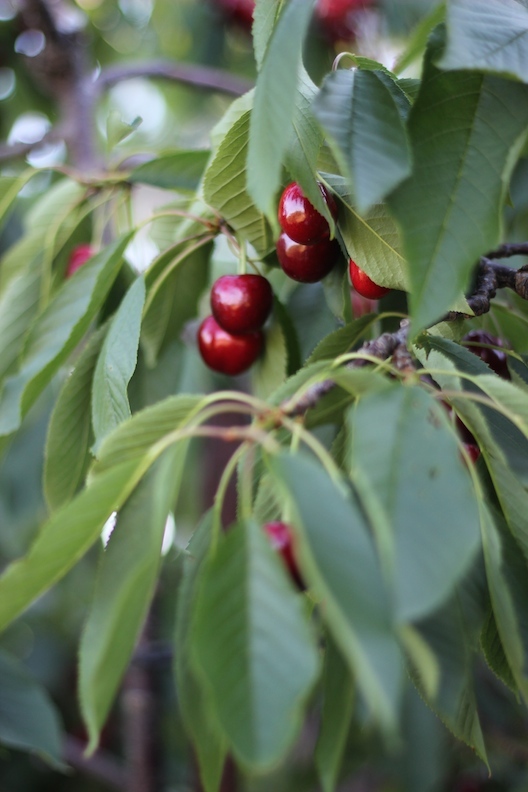 Last year there was an overabundance of cherries weighing down the boughs of the sour cherry trees, but because of the way the season went, this spring there were only sweet cherries available for picking. 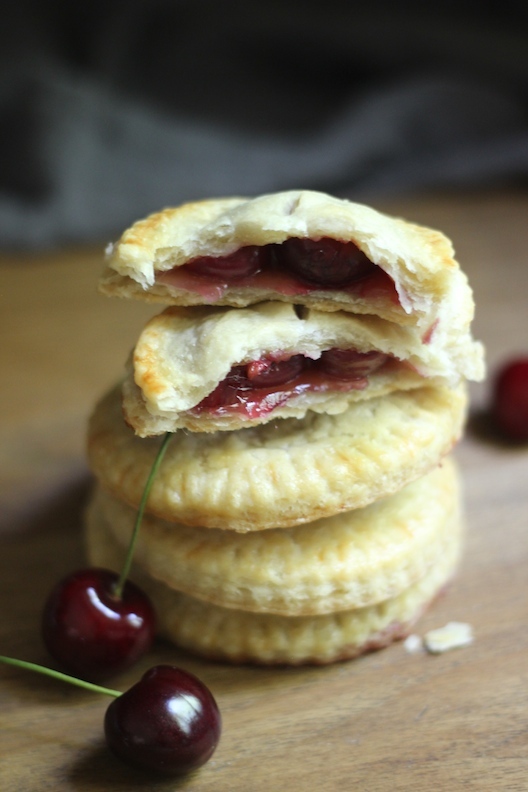 I had always heard that only sour cherries are good in pies. 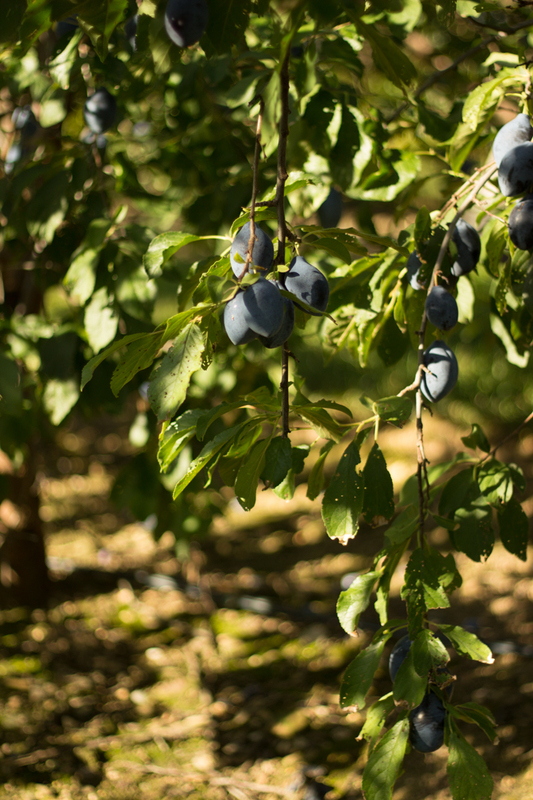 Still red, these early season Bing cherries had yet to turn deep purplish with fully developed sweetness. They made wonderful pies. In the bowl of a food processor, combine the flour, salt, and sugar. Add the butter, process until the mixture resembles a course meal, with some pea-sized lumps of butter, 8 to 10 seconds. It is these larger, firm pieces of butter that create flaky layers instead of a crumbly crust. Add 1/4 cup of the ice water all at once, pulse until the dough holds together when pressed, being careful not to process for more than 30 seconds. If still dry and crumbly, add more water, one tablespoon at a time. Divide the dough into two parts, dumping each part onto plastic wrap, and using the wrap to press and shape the dough into a flat disc. Chill in the refrigerator, tightly wrapped, for at least an hour. When you are ready to assemble the pies, stir all of the filling ingredients together in a medium bowl. Preheat oven to 400°. Remove one of the chilled discs of dough from the refrigerator. Roll out on a floured board to 1/8" thick. Cut out circles of dough using a 4" round cutter. Spoon 5 sugared cherry halves with a little of the juice onto each round. Brush lightly with cold water around edges. Set aside. Roll out and cut rounds from the other disc. Top each pie with a round of dough, crimping edges with a fork to seal. Refrigerate on a sheet pan lined with plastic wrap for 30 minutes. 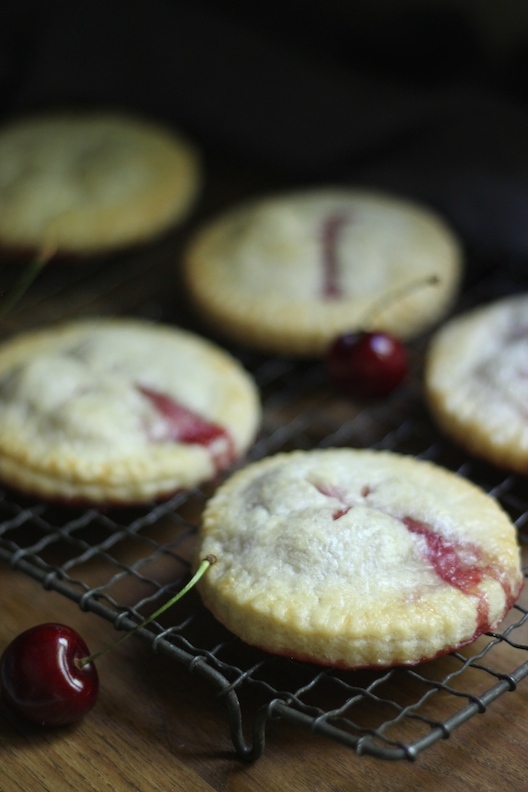 Remove pies from the refrigerator, place on parchment lined baking sheet. Cut slashes in the top of each pie to vent. Brush with egg white, sprinkle with sanding sugar. Bake for 20 - 25 minutes, until lightly golden and juices are bubbling.